Mapping changes at the village level with unmanned aerial vehicles. Visualizing daily changes to forests and cities with microsatellites. Tracking illegal fishing transshipments with machine learning. 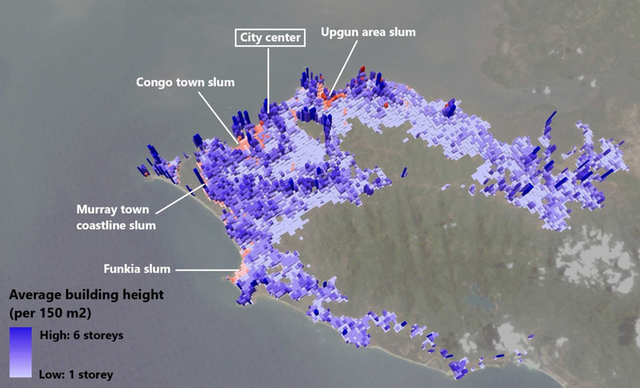 Identifying and tagging individual structures with OpenStreetMap. We can even mash up Donor and Government indices with physical infrastructure and project investments to identify causal relationships and show direct impact. That international development is now on the map was a key takeaway from the Technology Salon asking How to Visualize Our Impact with Geospatial Technologies? What can and cannot be mapped in a country? It might seem obvious with Google Maps that we can see the globe from space, but what data can we overlay onto the images? National Survey Offices in different countries have different rules around who can say what about a country – even where its borders are, as Google has learned. Governments also demand that data be “blurred” – made purposely imprecise in an effort to protect privacy, and then these data blurring standards are adopted by the World Bank, USAID and other donors, codifying the generalizations. While this is arguably a good data privacy practice, a two-kilometer location blurring makes it almost impossible to precisely plot project activity or impact in an urban setting. Vanessa Goas shared how she works directly with governments to create geographic data standards, including locating and updating the shape files for their administrative regions so they can accurately track donor investments. Yet governments don’t always keep abreast of changing data standards, which can impede geospatial technology innovations. For example, one country has digital photographs of all their road construction projects over time – an amazing database of project delivery progress. However, the EXIF data was removed, and replaced with GPS coordinates written onto the digital images themselves, as was done with print images in years past, rendering the data inaccessible to development practitioners. Quality staff are hard to find in any industry, and particularly cutting-edge technologies in developing countries, which impedes the ability of government to employ and retain quality staff. Private sector, and even development organizations themselves, often hire away the best GIS experts. The government GIS capacity gap isn’t just with technologists. Managerial staff don’t often have enough familiarity with geospatial technologies to understand that spatial questions are fundamentally different than statistical questions, and therefore they should approach GIS differently, and draw different conclusions from the results. A unique aspect of working with government is inter-Ministry rivalry. Several Technology Salon participants shared how different ministries would actively compete with each other or refuse to collaborate. The military was of particular concern, since maps are key to warfare. In countries without strong legal institutions, taking GPS coordinates and surveying facilities – even social services entities who could be expected to desire their locations mapped and capacities known – could precipitate harassment or arrest by security services. International development practitioners often have the impression that the private sector is always more advanced than us in the use of new technologies. This is true for private sector retail organizations, who lead everyone in their use of geospatial data to drive their investment decisions. KFC, which is now the largest fast food operator on the continent, has a very sophisticated analysis of people and their location that drives their new store openings. In somewhat a surprise for Salon participants, Dustin Homer shared how we are actually leaders in other ways. The private sector struggles with government, internal capacity, and the lack of reliable data as much as we do, and in some cases, is actually lagging development actors in its use of geospatial technologies to improve their commercial services. For example, development organizations usually have very precise household survey data based on their own outreach efforts, and are getting very sophisticated in locating project facilities. Sadly, even for all our GIS expertise, we are still stuck thinking of maps as marketing, not decision tools. Daniel Berger reminded us of all the times we’ve been asked to make a pretty map for a presentation or report, long after all the project decisions were made. Worse, we all have stories of how map data was adjusted, averaged, or outright manipulated to show an aspired result versus reality. Maybe we should start labeling such maps as “not based on statistically significant data“? What we all can do is advocate for geospatial technologies to be used the right way – as decision support tools to map the right directions within development organizations, government ministries, and the private sector.